I am often asked how I keep track of the upcoming feast days, so I thought I would share with you all my favorite calendar and daily planner. My mother-in-law has been giving Hubby & I each a copy of the Saints Calendar & Daily Planner published by Tan for years now and we love it! A great aid to sanctify each day! Covers 16 months beginning September 2010. 71 fascinating illustrations and mini biographies - one for every week. Contains both the Ordinary (Novus Ordo) and the Extraordinary (Tridentine) liturgical year,feastdays and Sundays, and historical feasts (such as Our Lady of the Angels, St Philomena, St Dismas the Good Thief). Includes Catholic information such as the days of fast and abstinence, Ember Days and vigils. Alphabetical list of over 700 Patron Saints. With more room to write, monthly planner pages and the same easy to use 5 1/2" x 8 1/2" size. 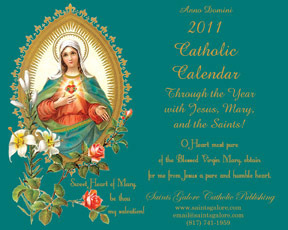 This beautiful, quality-USA-made, large 12" X 11" calendar is dedicated to the Immaculate Heart of Mary. It follows the liturgical year for both the Latin Tridentine (Extraordinary) and the Novus Ordo (Ordinary) forms of the Roman Rite of the Catholic Church. This calendar features traditional images, seen nowhere else, to honor each dedication of the month. It features the saint of the day, denotes the liturgical color of the day, gives reminders for novenas, includes quotes from the saints, and contains many beautiful and traditional prayers. There is also plenty of room for all your important messages. This calendar makes the perfect gift for anyone! Not only are they beautiful and inspiring, I love that both of these calendars follow both the Extraordinary and Ordinary liturgical years. 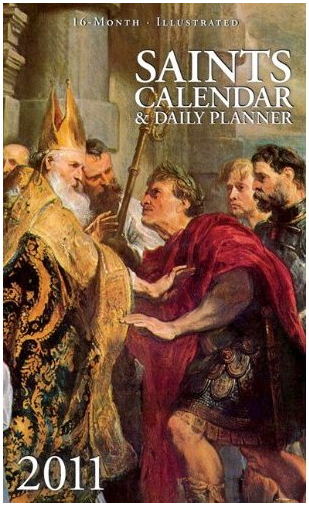 If you have a favorite Catholic calendar, I'd love to hear about it! Thank you for the link to Saints Galore Publishing. I'll be saving that link for my Christmas shopping! I love the products of Saints Galore Pub. I've been using Michelle Q's of family-centered press for a couple of years now. I like it and use it for everything. Elizabeth ~ Which size do you have? The Small or the Large? I considered her planner a few years ago, but decided against it since I really wanted one that listed both the new and traditional feast days. However, I just popped over to her site and it looks like she has added that feature now! Yay!! i love the calendars that list both, the ordinary and extrordinary feast days. however, i tend to use whatever i have been given or find for free in addition to the Ordo. I currently have the small version but, last year I did get the large. Both were fabulous but, the smaller fit in my bag..LOL. I added the menu planner to it, again a good time saver for me. BTW, first ultrasound in next Thur. Would you please say a little prayer for us. Thx! I've been getting the Saints calendar from Tan for several years and love that it has the Novus Ordo and the Tridentine feasts (I can actually fit this in my purse). I, too, am using Michelle Q's planner for the first time this year. So far I like it. I have the large size and it stays at home. Thank you for introducing me to the wall calendar. I'm going to order one soon. Oh, I also wanted to add that I had the meal planner added to the Family Centered press calendar. I find it very helpful.